In the Native culture, many times ‘the most valuable’ is saved to give away and ‘storing or hording things’ is not understood. There is a high value placed on giving away and sharing what is ours. Once something is given away, all strings to that gift are broken. The gift is given with no expectations. Native people believe that what is given always comes back to the giver in one way or another in another form of good. Native people also believe that bad (intentions, actions, etc.) results in bad returning to the doer. I believe that one of the greatest gift is when you give your time to others, in whatever form it is given. Although it is now the season for giving, it is good and healthy to be generous in spirit throughout the year. It is always the giver who receives the greatest blessing. I found a post, which puts it beautifully: Enjoy. 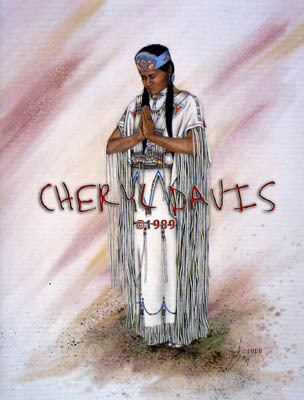 Give-aways can be traced back to the tribes/nations of the mid-western and high plains. As with fry-bread, we don’t know the specific tribal tradition of origin. In the broad sense, a give-away is nearly the reverse of the majority culture’s understanding of gift giving. In the majority culture, the expectation is to receive gifts when being honored, recognized, or celebrated on special occasions, such as birthdays, graduations, retirements, political elections, or special appointments. Historically, in the Native American tradition, many nations/tribes have conducted a give-away when being honored. One gives to strangers, not simply hoping to make friends, but because it is the honorable thing to do. One gives to honor a relative, and this in turn honors that person in the eyes of the community. One gives when one seemingly has nothing to give. Today the give-away practice continues in the communities and gatherings of many tribes and nations. It is being practiced more and more as Native Americans reclaim their traditions. Ray Buckley, who is a Lakota/Tlingit, said that in many Native American cultures, what matters is not what someone has but what the person is able to give away to others. “It is not the value of the gift, but the giving itself that is culturally relevant,” he said. “Giving a gift that may not have significant monetary worth, but significant spiritual or personal value is a sign of a giving heart.” In the Lakota tradition, he said, all living things created by God are often referred to as “people.” The Lakotas have a phrase, “mitaque oyasin,” which means “all my relations” and refers to all human beings, four-legged animals, and those that can fly, swim and crawl. “In The Give-Away, the four-legged and those that can fly gather for council to discuss the needs of the two-legged (human beings). In an attempt to meet the needs of humanity, they offer the most precious parts of themselves. In the end, it is the Creator who chooses to give away the greatest gift for humankind — the Son of God,” Buckley said. May we embrace the spirit of peace on earth. health, happiness and enduring friendships. If he hadn’t mentioned it, no one would have noticed that Bishop Bruce Blake was wearing moccasins. No one really looks at the feet of a bishop. Standing in front of the 2004 General Conference of the United Methodist Church in Pittsburgh, Pa., was a bishop wearing moccasins. They were not for show, but the honoring of a gift, demonstrated by the wearing. With the moccasins came a story. It was a story that would change those listening. Speaking to the United Methodist audience gathered from around the world, Bishop Blake spoke of giving as a means of healing. He spoke of giving with joy and of raising the standard of giving. He spoke of organizing lives around the Good News. He spoke while wearing moccasins and a beaded cross. Throughout the crowd, like woven beads, were those who had seen the moccasins. They were Ponca, Kiowa, Tlingit, Cherokee, Choctaw, Seminole, Creek, Lumbee and others. They had seen the moccasins and were quiet. Never in the history of the United Methodist Church had a bishop worn moccasins. Never had a bishop worn moccasins to honor his friend. It was a quiet moment, but it was not unnoticed. There was a memory of those in the audience that morning. There was a memory that for a time in the United States and Canada, the tradition of “giving-away” was against the law. Churches had condemned it as “squandering resources” and “impoverishing oneself.” To Native people, the give-away was a means to redistribute wealth among the community. It was a way to honor the life or memory of a loved one, and share with those around them. As Bishop Blake recalled, “The sharing was not in the form of words, but in the form of giving. Thousands of dollars of gifts were given to members of the tribe and friends. If persons needed food, the Roughface family gave them a basket of food. Others needed household supplies. The family gave them a basket of supplies.” As the Roughface family prepared for the give-aways, members of their community who were able donated blankets, money, cooking skills and prayers, so that they might give-away. Giving-away is a means of circular giving. Some who were in the crowd had survived Native American boarding schools operated by denominations and the U.S. government. There, their hair had been cut. They were not allowed to speak their languages. They were taught to read by reading the Bible, and those who taught them to read the Bible beat them with sticks if they spoke their language. Their clothing, jewelry and traditional names were taken away. They were told that if they were to be Christian, they could not be Native. Some believed what they said. Some would not teach their children. But others believed that God could use their culture and lives to refresh the church. They waited, living out their faith, as Native people, who loved God and their cultures. The moccasins that morning had become a gift of healing. They had become an affirmation that Native culture could be an offering, a give-away to the world. They became an affirmation that what God said was good, was good. It was a quiet moment. Many would not have singled it out. A bishop stepped up to a microphone wearing moccasins. They were a gift from the family of a friend, but the gift had been much more. It had been a gift of sharing, of giving from the heart. And one believer had responded to another, put on the moccasins and shared them with the church. They were soft footsteps, but they were heard. *Buckley is director of the Native People Communications Office at United Methodist Communications. Totem Poles were a way for Northwest Native Americans to share information. They were part of their oral tradition and helped to tell other people about themselves and their families. Memorial Poles were carved to celebrate special events such as births or weddings. Totem Poles that are actually part of a house are House Post Totems, a Mortuary Pole is carved for the dead and the most common Totem Pole is the Family Totem Pole. The Family Totem Pole used symbols to represent the power, wealth and standing of a family within their community. 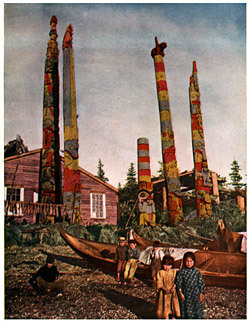 Often these poles were erected during a potlatch ceremony. Potlatch means to give away. These ceremonies could last for several days and would take months to plan and prepare for. During the potlatch, a clan would give away gifts and property to show their wealth and status. Sometimes they would even destroy their own property to prove that they were wealthy enough to replace it. The more a clan gave away the higher their status would go. The Kwakiutl was the most extravagant version of the potlatch. A recipient of a Kwakiutl potlatch gift would have to give away twice as much at the next potlatch. If someone were given two goat hair blankets at a potlatch they would be expected to give away four at the next potlatch. Sometimes, in order to repay this debt of kindness, a man might be forced to give away all his belongings. The potlatch could be used to honor friends or ruin enemies. Each Totem Pole tells a story using magical creatures that can transform from human to animal or animal to human. They live in the Sky Realm, the Realm or the Underwater Realm. Some can travel between the realms and some are stuck in just one realm. Each mystical animal/human has special or unusual characteristics. Beavers hate humans, Wolves are good drummers, the Devilfish or Octopus is attracted to the color red, Bears hate Thunderbirds and Frogs are associated with bringing great fortune or wealth. If you insult Frog he will tattle to Copper Woman who lives in the Undersea Realm and she will cause volcanic eruptions. Many Europeans had the wrong idea when they first saw Totem Poles. They thought that they were horrible monsters that the Native American Indians worshiped as gods. Many early missionaries helped to destroy Totem Poles and discouraged the people from carving more. The art of carving Totem Poles almost died out but is now flourishing again as many people are now recognizing the beauty and significance of them. I just could not leave your website before telling you that I really enjoyed the quality information you offer to your visitors… Will be back soon to check up on new posts. From Cheryl: Thank you Hannah! ahh if only we would take from what the Native Americans gave us in so many ways, and give back 🙂 Bless All ! Your website is a masterpiece of compassion and wisdom, it’s rather awestruck, I have been giving so much away not knowing the value, and now making Totem Pole Soy Candles, I gave my first one away to a young lakota girl of 12 year’s old to put in her Grandmother’s house, I’ve researched the tradition of the Totem Pole and very honored to make this and paint them . Thank’s so much for your integrity! Wow, this was so interesting! Giving until it heals, what a great revisioning of social relations. A circle of giving, a circle of healing. Thank you for this interesting blog, such good information.